Eight days later the disciples were together again, and this time Thomas was with them. The doors were locked; but suddenly, as before, Jesus was standing among them. "Peace be with you," he said. Then he said to Thomas, "Put your finger here, and look at my hands. Put your hand into the wound in my side. Don't be faithless any longer. Believe!" 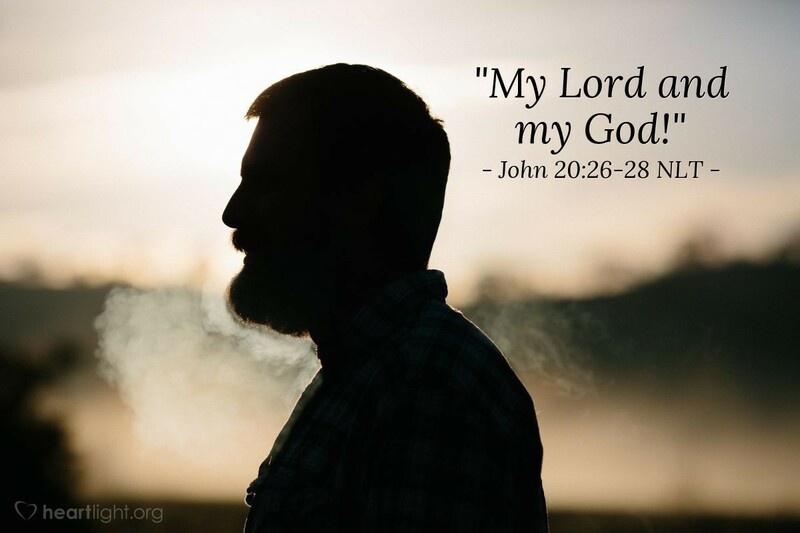 "My Lord and my God!" Thomas exclaimed. What is our reaction to the resurrected Lord? Who are we to understand Jesus to be? What is his role in our lives? Thomas gives us the words and the attitude, "My Lord and my God!" Now it is our turn to make those words true in our own lives! Lord God Almighty, who came in human flesh as Jesus, I praise you for your love, mercy, power, and grace. I bow down before you and offer you my life, my future, and my time to your glory. Amen.